While on promo for for M.O., Mr. Country Grammar found the time to debate Skip and Stephen A. re: Lebron’s greatness. I agree with you MO, Lebron’s the greatest. I don’t care how many sneakers you sell. Anyways, cop the new album Hurr. The St. Louis Trotters Ink Exclusive Deal with UrbanIFilms for coverage of their 2013 Fall/Winter Session in the dominant IBA League. In their effort to bring value to the franchise the St. Louis Trotters have reached a special agreement with UrbanIFilms to film their home games this upcoming 2013 Fall/Winter session. 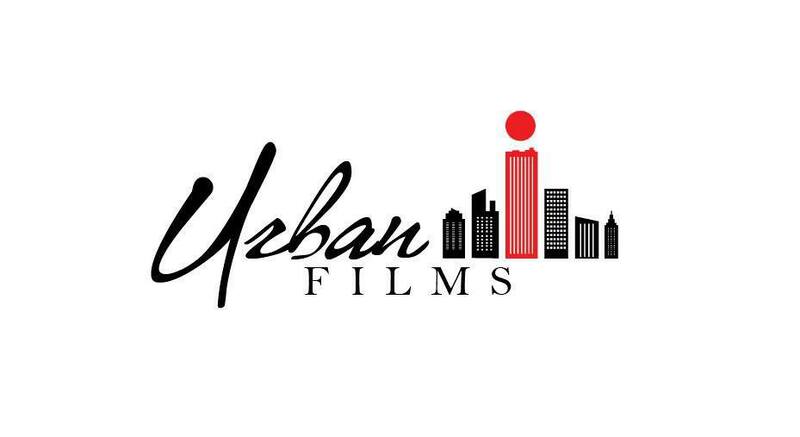 UrbanIFilms is based out of E. Saint Louis and specializes in the production of music videos, documentary, and narrative short films. The owner and operator Marquis Burton is known for his professionalism and quality. “I met Marquis Burton, while he shot for Delux Magazine during their birthday celebration for beloved radio personality, Tammie Holland,” says Trotters Director, DeWarren Smith. On this night Marquis wielded his Sony HDV with such ability and acumen that Smith was impressed. After a brief conversation, Smith took the businessman’s card and contacted him to discuss what he could bring to their organization. “Marquis and I began to discuss our needs and we came to terms quickly, like my Dad says, “It doesn’t take all day to do nothing,” and especially in this case there’s mutual benefit to both businesses. This being our second full year in the league we want to offer our advertisers value, our players game footage, and potential sponsors a substantive product to get behind. For Mr. Burton he gets “a front row seat to the best basketball action in the region,” says Smith, jokingly. The tandem will begin their work October 26th at the Trotters Home Opener at Mathews Dickey Boys and Girls Club in the Loynd Gymnasium. Tickets are $5 for adults, ages 18-12 are $3.00, and children under 12 are free. Half Time entertainment has yet to be announced but the Trotters are gearing up for a breakout season this year to establish themselves as the premier professional basketball organization in St. Louis and worthy of its franchise position in the growing IBA. The St. Louis Trotters’ Professional Basketball Club are ready to run this weekend! 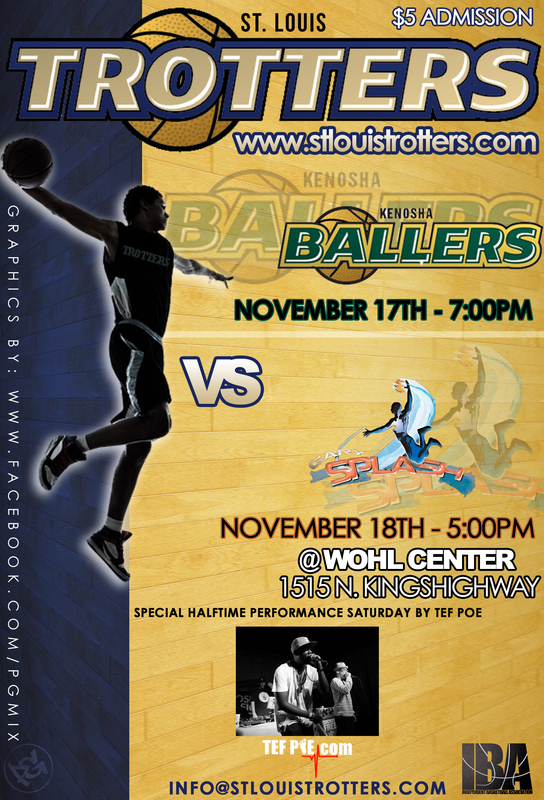 This weekend there is a Post Thanksgiving Day Basketball Showdown at Wohl Center 1515 N. Kingshighway 63113. 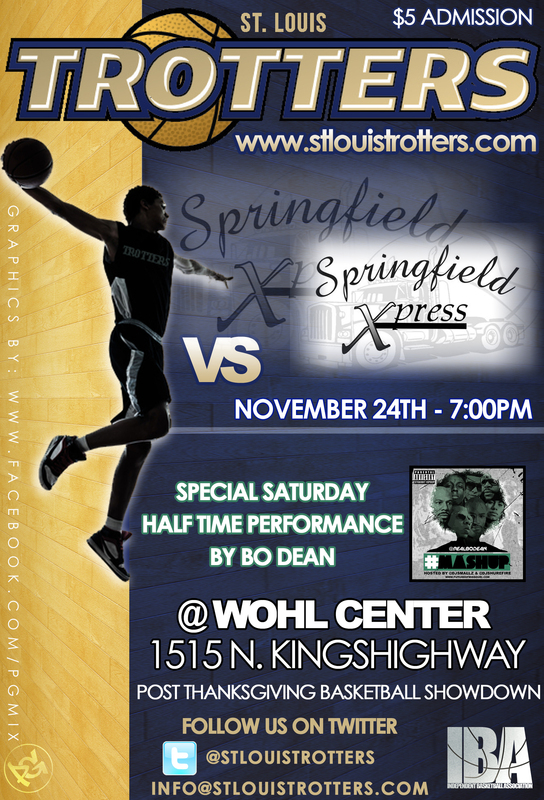 This weekend the Trotters take on two teams and first up is the Springfield Xpress out Springfield, Illinois. After coming off a 26 pt blow out against the Gary Splash of Gary, Indiana; our Trotters are ready to expand on their current record of (2-3). Tonite there is also a special Half Time performamce by Bo Dean fresh of that DJ Smallz and DJ ShureFire hosted #MashUp! Remember to come on out to the Post Thanksgiving Day Basketball Showdown at Wohl! Admission adults $5.00, 18-12 $3.00, &.children under 12 enter free! Alright we are just a couple days away from the St. Louis Trotters taking the court against a tough Kenosha Ballers team. This Ballers team record is a stellar 4-0 in the league and our Trotters’ team definitely will need our support! The Trotters are currently 1-3 in the league but their spirits remain high as they take on the team out of Kenosha, Wisconsin and Gary Indiana this weekend. Until they are ready to move into the Loynd Gymnasium at Mathews Dickey Boys and Girls Club the Trotters will continue to play at Wohl Center on 1515 N. Kingshighway 63113 Admission price $5.00 for adults, $3.00 for Ages 18-12, Ages 12 and under are FREE! This Saturday the Trotters have a special Half Time performance from XXL Breakthrough artist and Unsigned Hype artist Tef Poe, who is sure to bring some excitement to the building as he continues to soar to new heights in his music career headlining a show with Talib Kweli in December at the Old Rock House, Director of Team Operations for the Trotters, DeWarren Smith says, “This weekend is going to be action packed without a doubt! Personally, I expect a huge game from Nico, Kasper, and Mayo. These guys are a huge catalyst for our team!” So what’s up 314 are you ready to support our basketball squad the St. Louis Trotters? St. Louis Trotters Season Opener tonight at Wohl! So tonight is the nite! 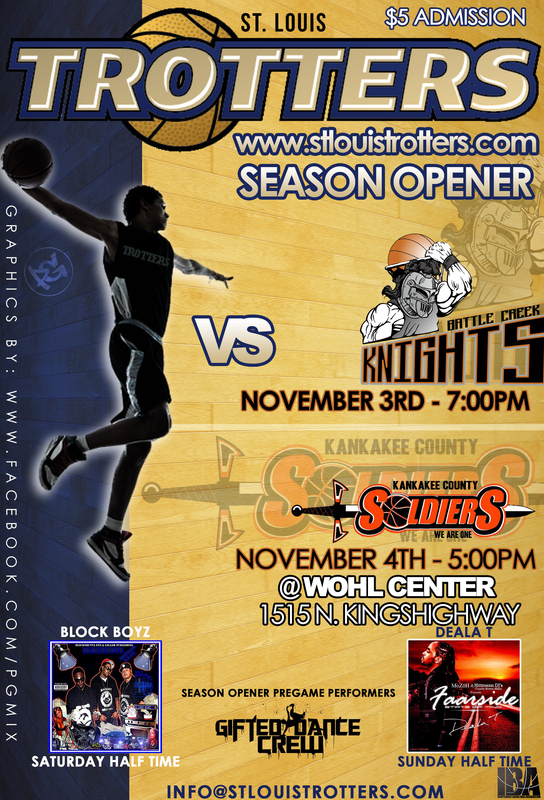 Tonight the St. Louis Trotters take the court against the Battle Creek Knights at 7pm. The location has been changed due to floor at the Richard B Loynd Gymnasium at Mathews Dickey, not being ready. A lot of preparation has gone into tonight, the team is ready to show St. Louis Basketball fans that they have a competitive team representing them in the Independent Basketball Association, says team owner Milan Pepper. Scheduled to perform this weekend are Gifted Dance Crew, Block Boyz, and Deala T.
There will be a lot of tests this season for the St. Louis IBA semi-pro squad. Please stay in the know follow them on Twitter @StLouistrotters and be on the lookout for more posts from Da Press here on Industry314.com! These Lambs passed up on RG3 then traded from 6 to 14 to pick up DT Michael Brocker of LSU. 101ESPN talks this and those red-hot Blues. 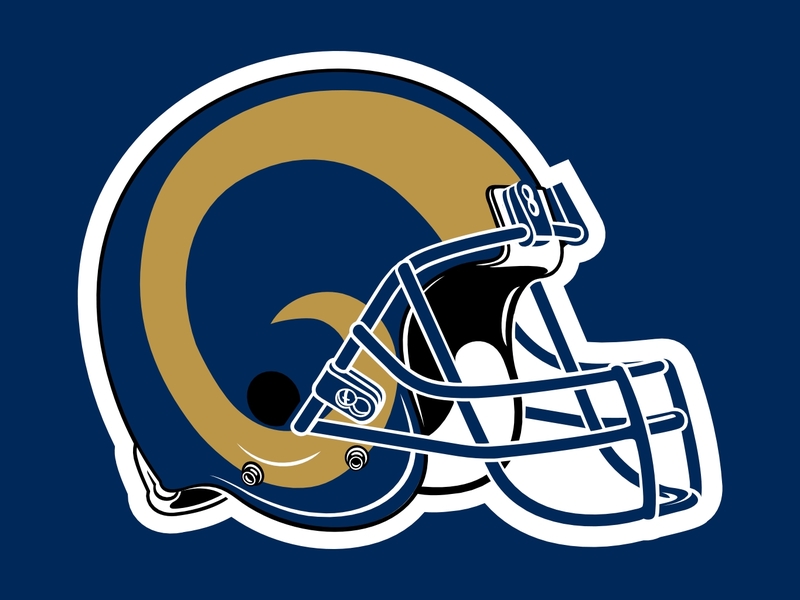 He Got Game: St. Louis #RAMS To Become The London #RAMS? LONDON — The St. Louis Rams took the first step to becoming Britain’s “home” team Friday, agreeing to play a regular-season NFL game in London in each of the next three seasons. And first up are the New England Patriots, who are two wins from another Super Bowl title. The Rams and Patriots meet at Wembley on Oct. 28, about two months after the closing ceremony of the London Olympics. That will be followed by games at Wembley against undetermined opponents in 2013 and 2014. The Rams are owned by Stan Kroenke, who is also the majority shareholder in the English soccer club Arsenal. The team will give up home games in St. Louis for the three seasons they are in London.